Chinese President Hu Jintao and other top leaders attended a grand ceremony Sunday in Beijing in memory of the 70th anniversary of the victory of the Long March. Hu Jintao, Jiang Zemin, Wu Bangguo, Wen Jiabao, Zeng Qinghong, Huang Ju, Wu Guanzheng, Li Changchun and Luo Gan attended the official memorial service. Wu Bangguo, member of the Standing Committee of the Political Bureau of the Central Committee of the Communist Party of China and chairman of the Standing Committee of the National People's Congress, presided over the ceremony. The ceremony was broadcast live by China National Radio, China Central Television and China Radio International, as well as Xinhuanet.Com and People.Com.Cn, the official Websites of Xinhua News Agency and People's Daily. The Long March was a famous military maneuver carried out by the Workers' and Peasants' Red Army from 1934 to 1936 led by the CPC to combat the Kuomintang Regime. Though many soldiers died on the way, the Red Army finally arrived at Yan'an in western Shaanxi Province after the 25,000-li (12,500-kilometer) trek, where the new headquarters of CPC was later established. Hu Jintao, general secretary of CPC Central Committee, state president and chairman of Central Military Commission (CMC), delivered a key-note speech at the ceremony, on behalf of the CPC Central Committee, State Council and CMC. He said the Long March, which opened a bright future for China's revolution and laid an important foundation for the victory of China's revolution, has been a "pride" for the Chinese Communists, the Chinese army and the Chinese nation as a whole. The aim of the grand ceremony, he said, is to encourage the whole Party, the army and people of all ethnic groups of China, to advance valiantly along the socialist road with Chinese characteristics. 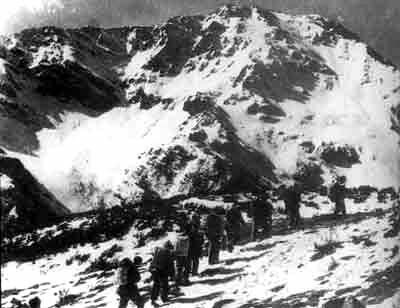 In his speech, Hu recalled the history of the "heartquake" Long March, calling it a rarely-seen expedition in the history of human warfare, referring to the long time it took, the long route it traveled, the great disparity of force between the Red Army and enemy troops it witnessed, and the abominable natural conditions it experienced. The victory of the Long March shows the outstanding capabilities of the Chinese Communists in leading the revolutionary war, the undaunted spirit of the Red Army officers and soldiers who had bravely sacrificed their lives for national independence and people's emancipation, and the fact that the just powers of the people's revolutionary war is unbeatable, the top leader said. He said the Red Army's Long March is a great turning point for the Chinese Revolution to go from defeat to victory, which ushered in the new dawn and opened up a bright future for the Party to unite and lead the people to beat the Japanese Militaristic Aggressors and strive for building a new country being independent, free, democratic, united and prosperous.